Several women wondered. More than a month before 16th December, our community leaders began talking to women about participating in Pinkathon. “kya karna hai? Wahan jaake bhagna hi toh hai” (What do we have to do? Just go there and run) Many women said, “Kaise jayenge itni subah? Kya pehenke jayenge? Lower pehenke ghar se kaise niklenge? (How will we leave so early? What do we have to wear? How can we wear lower (pants) and leave the house) With such questions on their mind, women began gearing up for Pinkathon. Meetings were conducted in the community, 10 buses were arranged for travel and women decided to stay up all night in each other’s homes, singing, talking and making merry. Some women went jogging every morning, before the main event. Slowly, the pace began to pick up and a buzz was created in the community. The day before the marathon, there was barely any space to take a break. Our community leaders and the rest of the team were all nose deep into preparing for Pinkathon. While our team leaders were making rounds in community telling women to be prepared for the next day, the rest of the team were involved in other preparations. A sense of excitement and rush, with a tad chaos came over all of us. More than anything, everyone was excited to go to Bandra and run! To run for a cause, is the call for ‘Pinkathon’. Women across the city of Mumbai participated in this run, taking along with them their own stories of empowerment. 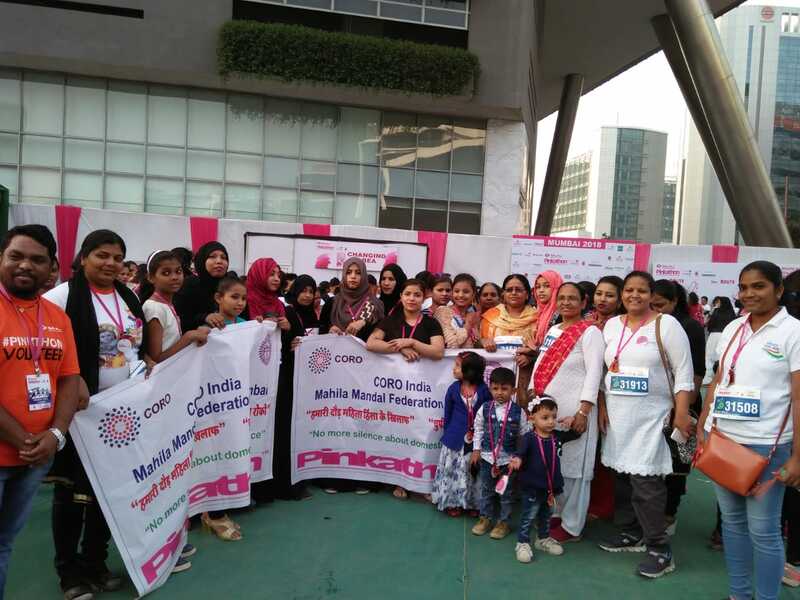 Pinkathon is an annual marathon organized across the country, where women from varying backgrounds participate. This marathon is motivated by the need to raise awareness about breast cancer and overall health among women. Women run with the message, “a healthy family, a healthy nation and a healthy world begins with empowered women”. For the women from our communities however, running for this marathon was breaking free! Breaking free from their everyday routine, breaking free from their regular attire and breaking free from their inhibitions. To be unfree! 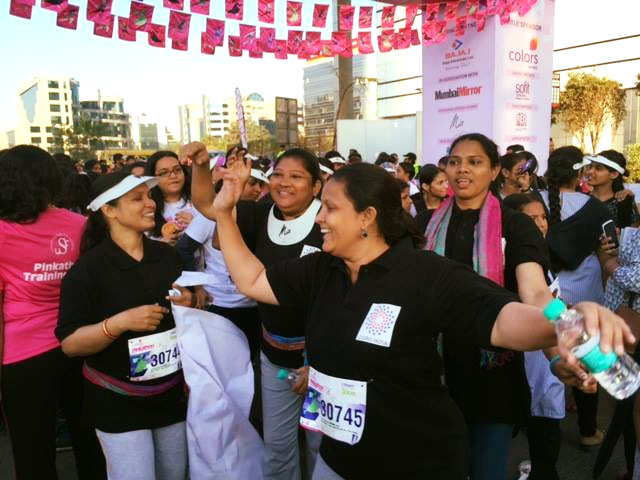 From our communities in Mumbai, 440 women participated in Pinkathon. Young girls and women of all ages participated, our youngest being 7 and oldest being 85. The whole environment at BKC, with tall fancy buildings, a huge ground with a stage and a massive screen Health was the primary focus of this marathon, which was also reflected in their method of entertainment; Zumba! Women followed the dancers on stage were and had a gala time. And our community women did not stay behind in keeping up with everyone. They moved, danced, followed steps, encouraged one another and made that space their own. For most women, this marathon was a first of many kinds. First time women wore “lower” (trousers/pants) and t-shirt, many women danced for the first time, many women left morning household chores at the hands of the men for the first time, many women visited an area like BKC for the first time and many women dropped all their inhibitions for the first time.